Textures and shader for the DAZ V4 Bodysuit to turn it into the New52 Wonder Woman outfit. Also included are conforming New52 accessories to match the bodysuit. Thanks to FredAckerman for testing this for me and giving advice on the metal shaders. Tiara, Choker, Armband, Bracers left and right, BreastPlate, Belt, Lariat x2 versions, Boots included as CR2. Bodysuit MAT, Seams setting, accessory MATs as PZ2 and dsa files. DartsBub (1 year ago) Inappropriate? miketee10021 (2 years ago) Inappropriate? sheridan2010 (2 years ago) Inappropriate? abobo (2 years ago) Inappropriate? Mickael989 (3 years ago) Inappropriate? JohnA (4 years ago) Inappropriate? I didn't find a readme file, and I can't figure out how to load the outfit in DS 4.8. I tried searching for WWN52 and RoguePilot. Then I tried to import the object files, but I can't get the scale right. Am I the only one having trouble? Juan Castillo (4 years ago) Inappropriate? 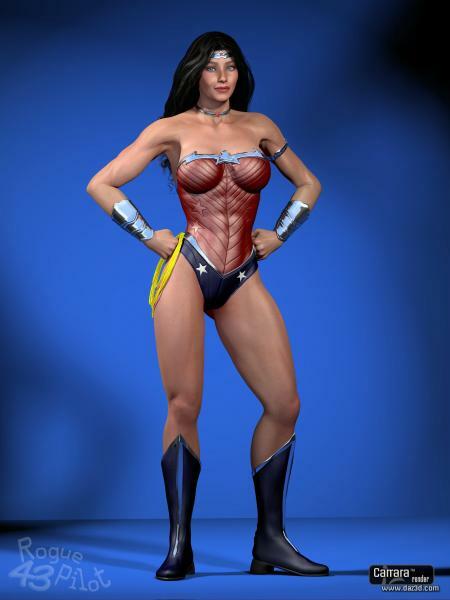 Just uploaded my custom Wonder Woman - Diana Prince Head and Body morphs to go with your 'Wonderful' outfit. Thanks so much for such a great share! marcelochaves1 (4 years ago) Inappropriate? stoper (4 years ago) Inappropriate? Dex MacLeod (5 years ago) Inappropriate? Very, very Cool! Thanks for this. firasalsaaedi (5 years ago) Inappropriate? Super, vielen Dank. Thank You! aldebaran (5 years ago) Inappropriate? Wolfhound Jack (5 years ago) Inappropriate? dutchman (6 years ago) Inappropriate? kev67 (6 years ago) Inappropriate? SoylentPurple (6 years ago) Inappropriate? Any chance you can make the body morph available? I've been looking for a good muscle older woman. Mine always seem to get too muscled. tommyd79 (6 years ago) Inappropriate? AetherDream/QuantumRiver (6 years ago) Inappropriate? leonidas1029 (6 years ago) Inappropriate? jakiblue (6 years ago) Inappropriate? Excellent job! Thanks for sharing every time. Kizmit (6 years ago) Inappropriate? Knight22179 (6 years ago) Inappropriate? This is great! I posted an image at deviantart,(LeAKyGrAPHics)..will be doing more soon. Thank you for all you great textures,cloths, and props. azatoth (6 years ago) Inappropriate? Looking forward to render with it. RavenScarX (6 years ago) Inappropriate? cipher•xtreme (6 years ago) Inappropriate? dlfurman2 (6 years ago) Inappropriate? EXCELLENT job! Much thanks for this offering. Suucat (6 years ago) Inappropriate? thestarkiller (6 years ago) Inappropriate? Gonna add to the praise here. Good work. Bravo, RoguePilot! I and many others appreciate greatly what you do. This is what keeps me opening up Poser! jgumpc (6 years ago) Inappropriate? This looks amazing. I can't wait to use it. Thanks for sharing! LordSnot (6 years ago) Inappropriate? mattymanx (6 years ago) Inappropriate? November (6 years ago) Inappropriate?